Custom Modular With Sunroom | Excelsior Homes West, Inc.
Are you looking for a rambler style home with a sunroom? The Custom Modular with Sunroom offered by Excelsior Homes West, Inc. may be the perfect home for you! Have you always wanted a place to sit and relax after a hard day of work? Well, this custom modular with a four season sunroom is the perfect floor plan for you. This floor plan has approximately 1680 square feet of living space and includes three bedrooms and 2 bathrooms. This split floor plan separates the master suite from the other two bedrooms with the living room and kitchen between. The master suite includes a spacious bedroom with an end suite and walk in closet. The extra space in the sunroom offers the finishing touch. This particular home was previously displayed on our display lot in Hutchinson, MN but has since been sold and delivered to a customer’s home site in Welch, MN. We have many floor plan options available and can build interested customers a custom modular home with sunroom. 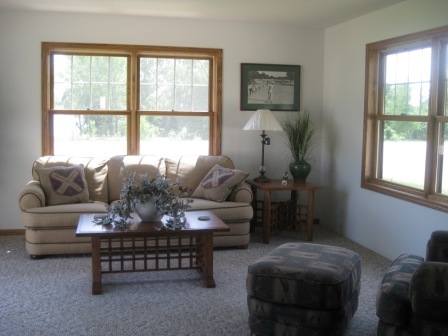 Excelsior Homes West, Inc. can offer a customer modular with sunroom. Let us customize a modular home for you! Our job is to find the right home for each one of our customers. We want home buyers to know that you are not limited to the standard floor plans. Through our manufacturers, Schult Homes and Stratford Homes, we can customize floor plans to meet your housing needs. Either select from one of our floor plans, bring us your own, or let us help you come up with something just right for you. Once you select your plan then you can select the options and upgrades you desire, both for the interior and exterior. We can start with a rambler style floorplan and add a four season sunroom. Contact us today for more information.